Sigrid Merth heads the staff development department at the Styrian Business Promotion Agency (SFG). 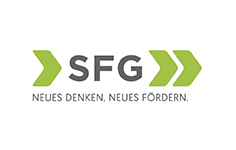 The SFG is a service provider, which aims to contribute to the consolidation and growth of the Styrian economy and employs about 75 people. Furthermore she is active in strategic project management as the assistant of the SFG´s management board. Sigrid Merth holds a MSc Degree in economics from the Karl-Franzens University in Graz and specialized in International Management and Institutional Economics.